Vapor recovery is a critical necessity for countless companies, which are required by law to mitigate the expulsion of potentially-explosive and noxious fumes. One of the industry's most trusted names, Kuriyama manufacturers the world's most reliable vapor recovery hoses, used throughout the world by organizations that can't afford to settle for second-tier products. Increased durability: Heavy-duty construction, featuring thick walls for enhanced lifespan. 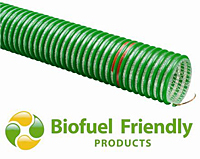 Biofuel Compatible: Made with a revolutionary polyurethane compound, these hoses are specially-designed to handle gasoline, diesel, biodiesel and ethanol vapors. Increased flexibility: Non-permeable polyurethane construction won't become stiff or swell like conventional TPR/rubber hoses - even in sub-zero weather. Maneuverable: Much lighter weight when compared to conventional TPR/rubber hoses. Transparency: “See-through” construction allows for visual confirmation to guard against fuel backup in vapor recovery system. Grounding Wire: Multi-strand copper wiring dissipates static electricity. 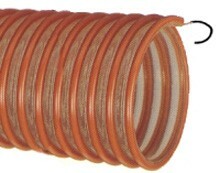 Easy Slide Helix: Durable counter-clockwise helix design allows hose to slide easily over rugged surfaces to prevent cover wear. Fluid handling operations demand safe, leading-edge products from knowledgeable providers with decades of experience. For more than 30 years, Arm-Tex has provided the world's best products to help its loyal clients solve their most difficult challenges. Over these three decades, we've cultivated lasting relationships with the top brands, allowing us to provide reliable solutions at cost-competitive prices. Contact our office to learn more about Kuriyama Vapor Recovery Hoses, along with our many other high-performing products.